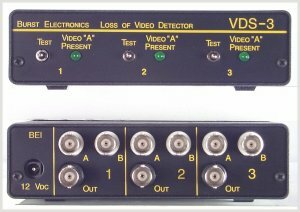 The Burst Electronics Model VDS-3 (and the single-channel VDS) detects the presence of composite video at its A input and outputs this video. If loss of video on the A input is detected, then the unit switches to the B input, lights a Red LED (VDS only), and energizes an internal "tally" relay (standard on VDS and VSA, optional on VDS-3). This relay may be used to control external devices. The tally relay has both normally closed and normally open contacts (Form C relay). The Model VSA includes stereo audio switching, audio follow video. The video detection process utilizes a sophisticated sync separator circuit and a micro controller IC to analyze the A input. The composite sync tip amplitude, vertical sync, horizontal sync, and frame pulse are all analyzed by the micro controller to determine the quality of the incoming video on the A input. The frame test allows progressive scan video signals (blue screen) and VCR search and pause modes to be detected as bad video.